An elderly woman was seriously injured when a robber hit her over the head with a hammer on the Spen Valley Greenway yesterday afternoon. The 76-year-old victim was approached from behind while walking on the greenway near the Tesco supermarket in Cleckheaton at around 2.20pm. Part of the greenway was closed to the public following the attack to allow forensic work to take place at the scene. Police today said enquiries were ongoing to trace the suspect, who escaped with the woman's purse. 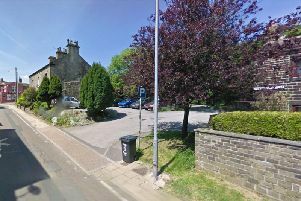 Detective Inspector Mark Colman, of Kirklees CID, said: "This is a very serious incident in which an elderly victim has been struck to the head in a violent attack near to a shopping area. "Fortunately the victim was not seriously injured but this assault could easily have had far worse consequences and it is important we locate the man responsible as soon as possible." The woman was taken to hospital for treatment to the head injury and remained there overnight. Her injury is not described as life-threatening. The suspect is described as a slim, white man, aged around 60, and was wearing a woolly bobble hat and glasses. Det Insp Colman said: "A number of enquiries are ongoing today, and I would like to speak to anyone who saw a man wearing a bobble hat and glasses in the town centre area, the Greenway or at Cleckheaton bus station just before or after the attack took place." Contact Kirklees CID on 101, referencing crime number 13170207307. Information can also be passed on anonymously to the independent Crimestoppers charity on 0800 555 111.